Don’t miss these Canden meetings! Speakers include Jeremy Corbyn, David Lammy, Frank Dobson, Emily Thornberry, Candy Udwin and Owen Jones. This meeting will be massive! Make sure everyone you know is coming and get there early. Speak out on benefit cuts, hear Council response and plan action. Loud speaker cars touring Camden! Cars toured Camden and supermarkets were leafleted on Saturday to make sure people know about this meeting. April will see further cuts to Housing, Council Tax, Disability and other benefits and the introduction of a Bedroom Tax. These will have a huge impact in Central London. Sign up to the campaign pledge to say no to divide and rule and to back action against this injustice. Leaflet and pledge attached. camdenunitedforbenefitjustice@yahoo.co.uk. About a 100 people at the Camden Keep Our NHS Public meeting on 04 February heard from Frank Dobson, Shirley Franklin about the Whittington Hospital and a Camden fire fighter about station closures. Print Room cafe, UCL, Gower St, WC1 The exhibition incorporates photography and text about UCL Management’s plans to bulldoze this council estate. 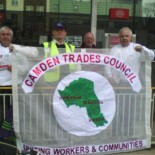 Donations payable to “Camden Trades Council” and marked for Camden United.